THE MARGARET CLEMONS FOUNDATION (MCF) is delighted to announce our partnership with HELP & SHELTER, Guyana. Help & Shelter (www.hands.org.gy) is Guyana’s most prestigious NGO whose efforts on behalf of women & children have reached into all 10 administrative Regions of that country. Help & Shelter provides a safe haven for women and children escaping violence at home. This wonderful organization operates on the highest level of internationally accepted standards for sheltering victims of violence, fostering awareness, providing community outreach and counseling and conducting research to name some but not all of the important work that is undertaken on a daily basis by this vital organization. MCF is thrilled to join Help & Shelter to end violence against women and children in all of its forms. MCF will support training programs for Help & Shelter’s social service providers and counselors, which may include Certificate Training Programs and Bachelor’s and Master’s degree programs in counseling and expressive therapies which will help to further professionalize social services in Guyana. This training will initially be targeted at counselors and social service providers working with women & children and would include expressive art therapy approaches in which counselors engage clients in the healing process through the therapeutic use of the arts. Lesley University staff in a “train the trainer” model written to be culturally specific to Guyana will deliver programming and training. MCF staff to explore possible options for the design of the counselor training program. Minister Manickchand also described Guyana’s social services and articulated the interests of her government that all training be culturally relevant and have a train the trainer component so that capacity is built within Guyana to deliver and sustain training in the future. The Minister met with Lesley University president Joseph Moore who reconfirmed the University’s commitment to partner with the Guyana Government. Meetings were also held with Lesley provost Martha McKenna, Associate Provost Gene Diaz, Division Director of Expressive Therapies Mitchell Kossak, dean of undergraduate studies Mary Coleman and professor of education Marjorie Jones who is Guyanese born and who was formerly employed as vice chancellor and dean of the education faculty at the University of Guyana. 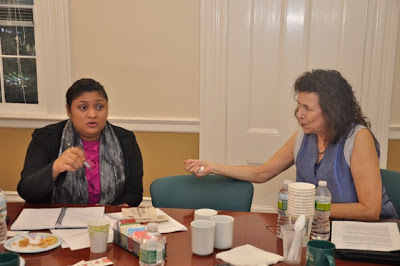 Staff of the Margaret Clemons Foundation, who introduced leaders in the government of Guyana to leaders at Lesley University, reiterated that it would continue support of this emerging partnership and other activities that could help to end violence against women and children in Guyana through the arts. 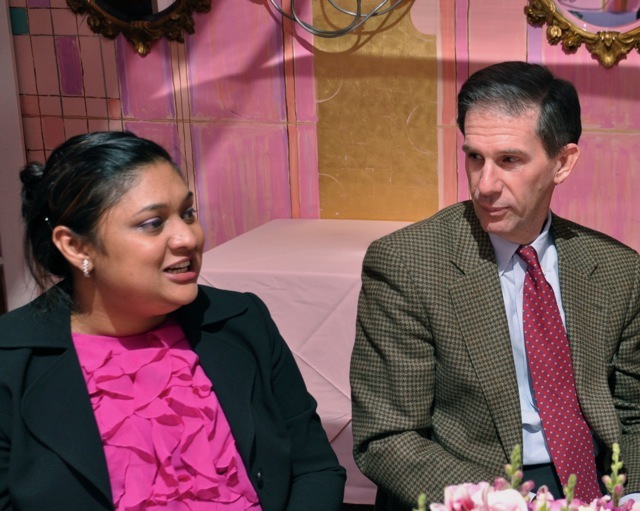 In this photograph Minister Manickchand chats with Lesley University president Joseph Moore. Dr. Marcow-Speiser described how she helped to develop a similar counselor-training program in Israel, which now has a 30-year track record of success. That program was also designed as a train the trainer model. 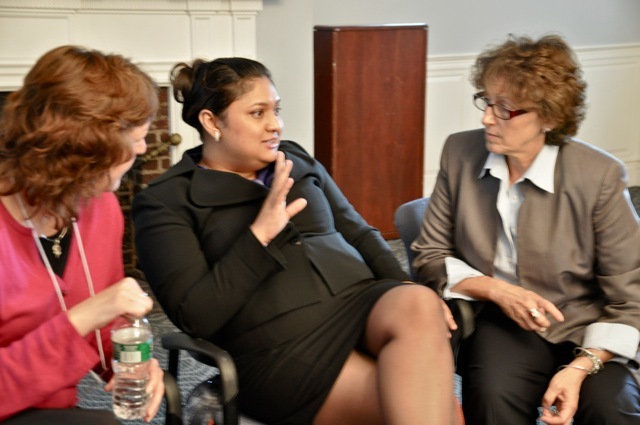 Minister Manickchand talks with Lisa Donovan, Director of Lesley University’s Creative Arts and Learning Division and MCF president Margaret Clemons. Minister Manickchand also met with Lesley biologists, David Morimoto and Michael Schindlinger who both serve on the Board of Directors of Exotic Wildlife Sanctuary, which provided the seed money and technical training to build the Mapaima Eco lodge at Nappi Village (Rupununi). Nappi Village has been recognized as one of Guyana’s premier places to encounter wildlife and the eco lodge now plays a pivotal role in supporting the village’s ability to create non-extractive income streams from tourism. 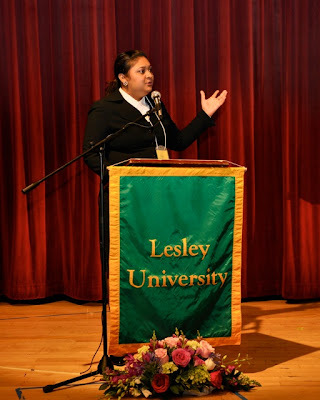 Morimoto and Schindlinger lead Lesley students to Guyana every year in a course entitled ‘Field Experiences in Tropical Ecology’ as a way of increasing students’ global awareness of issues in biodiversity, development and human ecology across cultures. be moved after hearing David Morimoto confess to her that he cried when he saw the Harpy Eagle in its natural habitat deep in the interior jungle of Guyana? 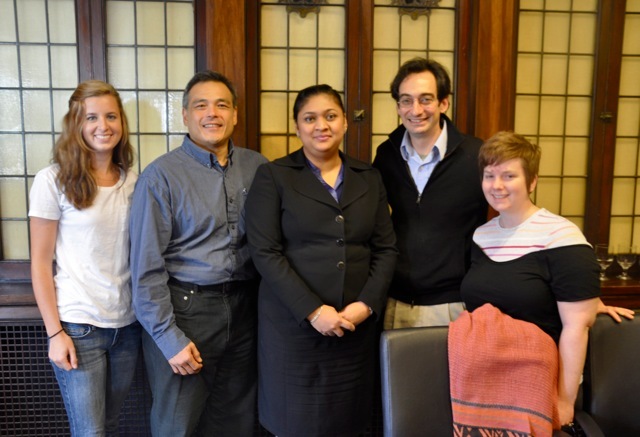 David Morimoto and Michael Schindlinger and students, who traveled to Guyana to study that country’s biodiversity, pose with Minister Manickchand. 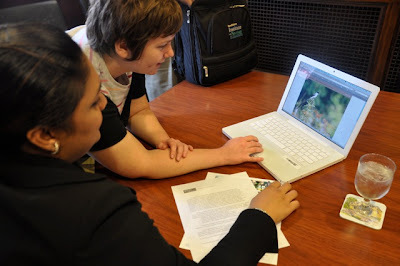 Casey Grenier showed Minister Manickchand the photographs taken on her trip to the interior jungle in Guyana. Casey Grenier, one of the students who participated in this program earlier in the year subsequently created a blog and posted the photographs that she took of the jungle wildlife in their natural habitat and the indigenous folk who hosted and guided them in and around Guyana’s pristine, wild and sensational jungle (http://guyanagrenier.wordpress.com). You will be amazed at the photographs taken by this talented amateur photographer and Lesley student. 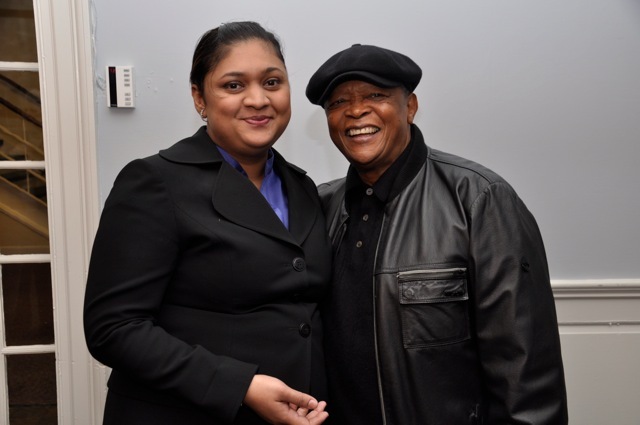 initiatives underway in Guyana in defense of women and children. This resulted in an invitation for the Minister to participate as a keynote panelist with Prime Minister Kim Campbell of Canada at Harvard’s Kennedy School of Government’s conference “Closing the Gender Gap”. Secretary General of the Council of Women World Leaders Laura Liswood moderated the panel discussion. 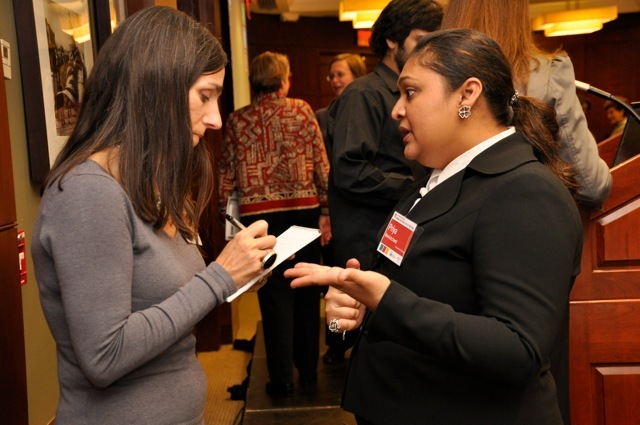 The Council co-sponsored the conference with Women & Public Policy at the Kennedy School. Minister Manickchand who is a lively, talented and thoughtful speaker brought new perspective to the discussion at the conference and was very well received by all who participated and by the media. Live blog coverage was handled by MSNBC. Laura Liswood and Prime Minister Kim Campbell look on as Minister Manickchand speaks on the issue of quotas to the audience, which included professors, students, presidents and directors of organizations and banks, and business owners and CEOs. 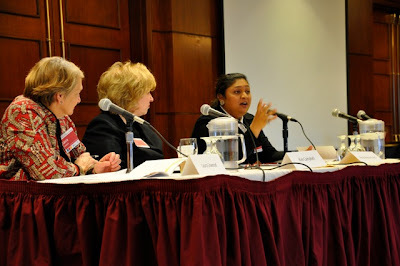 Minister Priya Manickchand addressed this packed audience at the Kennedy School of Government while Prime Minister Kim Campbell listened in. 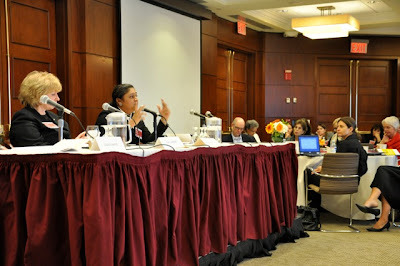 Minister Manickchand posited that political power matters in closing the gender gap across the world and expressed the view that political power derived from political office has tremendous benefits one of which is to allow for the culture of a country to be shaped and changed by public policy derived from political office. 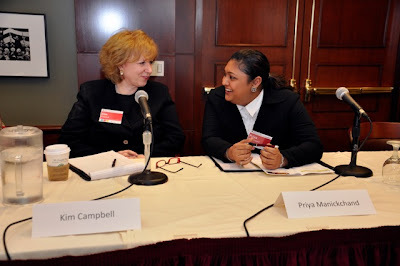 A private moment shared between PM Kim Campbell and Minister Priya Manickchand at the start of the panel discussion. Minister Manickchand in an after conference interview by MSNBC live blogger. 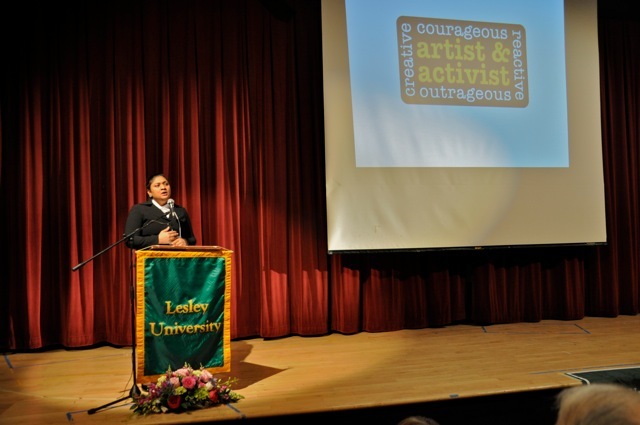 Minister Priya Manickchand & South African artist and activist Hugh Masakela honored at Lesley University’s “Arts & Activism” conference. During a two-day Arts and Activism conference on October 14th and 15th at Lesley University, Minister Priya Manickchand and world renowned jazz Musician and civil rights activist Hugh Masakela, were honored by Lesley University for their demonstrated commitment and leadership to advancing gender and racial equality around the world. Minister Priya Manickchand posed with world-renowned jazz Musician and civil rights activist Hugh Masakela at a dinner held in Cambridge to honor them both. MCF’s president Margaret Clemons introduced Minister Manickchand the morning of the keynote address. Minister Manickchand delivered the keynote speech for the conference “Arts & Activism” and spoke of her early years working as an attorney for Guyana’s Legal Aid Society, an organization that she has since expanded to 7 regions in Guyana. 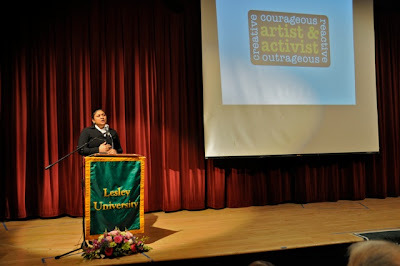 Her compelling speech touched the audience who in later workshops referred to her accomplishments as “PRIYA’S RADICAL LOVE AND LEGISLATION”. Minister Manickchand told of her early years at the Legal Aid Society in Guyana. She told professors, students, and professional counselors about the destructive effects of gender based violence, its causes and possible solutions. The Minister was adamant that an intensified global effort has to be made for gender equality using innovative means if the world is going to be all it is capable of being. Minister Manickchand reflected on her accomplishments and on the many gender-based challenges that confront her ministry and all of our societies. The Minister also took questions from this highly engaged audience. successful in moving our programming forward and served to better inform us so that programming could be Guyana specific and relevant. We are now moving towards training a first cohort of 20 counselors from the Ministry and Help & Shelter beginning in June of 2011 as well as rolling out our Community Arts program.